After years of using Santa Gertrudis bulls in their own commercial operation and managing a family-owned purebred ranch, Wortham Bend Farms, Bill and Kati Barrett and their three daughters began Five Oaks Ranch. 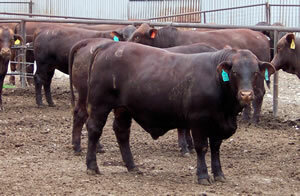 With foundation females and herd bulls purchased in the Wortham Bend Farms dispersal sale in 1980, Five Oaks was born. The ranch is headquartered on the Brazos River in the Wortham Bend community north of Waco, Texas, and cattle production is devoted to performance-based POLLED purebred Santa Gertrudis. 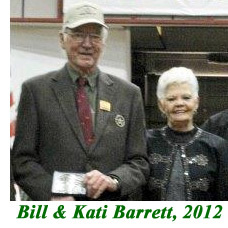 The Barretts are devoted to identifying and producing high-performance polled cattle that will make a profit in the feedlot as well as in the pasture. Emphasis is placed on feed efficiency, as well as longevity in female family lines. For 22 years, Five Oaks Ranch hosted an annual production sale, offering Santa Gertrudis gain-tested, polled herd-sire prospects and breeding-age females. Because extreme drought has impacted the Central Texas area for the past several years, a production sale was not held in 2013. Our Top Hands Barrett Brown & Chance Doty worked every sale from the time they were 14 years old…both now married! Click to learn more about Bill Barrett and the history of Five Oaks Ranch, The Barrett Family and Scholarships awarded by Five Oaks Ranch.